King Salmon or also known as Chinook is the largest Pacific Salmon that grows to an amazing size. These fish are one of the favourite salmon for fly fishing anglers all over the world. Found and caught in abundant numbers in Alaska, Canada even Argentina, they are famous for their immense power. Doing battle with these fish on a fly rod is an experience all fly fishermen should try and we have lots of fishing holidays where you will be hooked by the King Salmon fever. Join our hosted weeks for monster King Salmon in the foothills of the Andes. This little river is producing huge King Salmon which so far have an average weight of over 50LB. Every year King Salmon go upriver to their spawning grounds giving us the chance to swing flies for a fish of a lifetime. 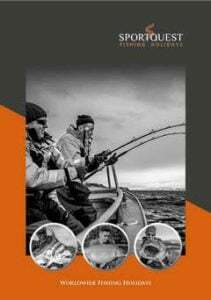 If you are a salmon angler, this is not to be missed. In this lonely place of the Andes the King Salmon have developed a healthy population that continues to grow every year due to low fishing pressure and not having many predators. We have developed this fishing as an extension to our Sea Trout fishing packages, it can also be added to our Golden Dorado. If you are looking for an incredible fly fishing holiday for Steelhead, Salmon or Trout with the comfort of having your own single room with private en suite bathroom our lodge on the banks of the Skeena River is the perfect destination. Our guided Steelhead and Salmon trips offer spectacular fishing for all levels of anglers.